The largest commercial airlift of horses ever undertaken in the history of horse sport has begun ahead of the FEI World Equestrian Games™ Tryon 2018, which get underway in North Carolina (USA) on 11 September. The first 67 of a total 550 supremely fit airborne equine athletes have now set foot – or should that be hoof! – on the Tryon International Equestrian Center venue, nine days before the start of one of the biggest sporting events on US soil this year. They will join a further 270 horses coming overland to team up with their human partners from over 70 countries at these Games, which are world championships in all of the FEI’s eight disciplines and qualifiers for the Tokyo 2020 Olympic and Paralympic Games. Specialist horse transportation company Peden Bloodstock – working alongside The Dutta Corp – has coordinated the highly complex logistics, with horses from six of the world’s seven continents flying into Greenville-Spartanburg International Airport (GSP) in South Carolina and Miami, Florida. The horses will be flying into the USA on a total of 23 flights from Liège (BEL) and Dubai (UAE), plus flights from 11 South American cities including Buenos Aires (ARG), Sao Paolo (BRA), Santiago (CHI), Lima (PER), Montevideo (URU) and San José (CRC). 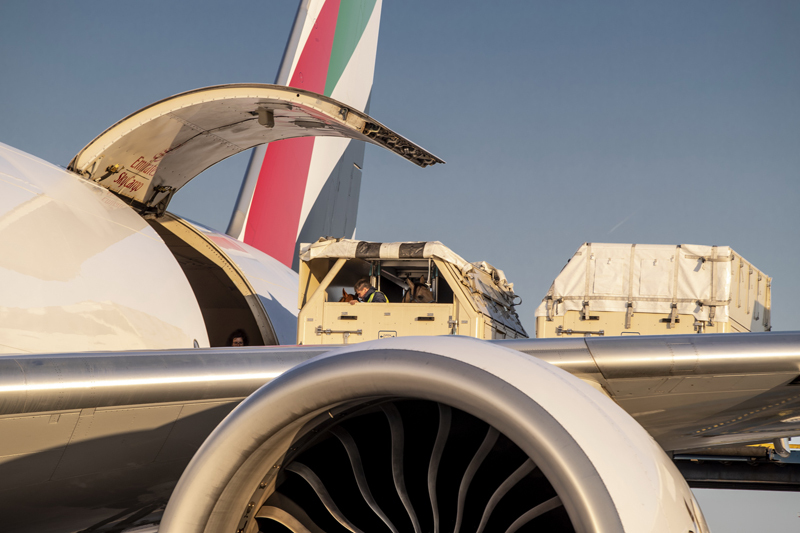 Emirates SkyCargo, a world leader in the air transportation of premium horses, is now celebrating its largest ever horse charter, which started with the landing of flight EK 9387at GSP yesterday afternoon. The horses are flying on a specially designed Boeing 777 freighter aircraft in customised stalls, with independently air conditioned zones maintaining the perfect temperature for these four-legged athletes, which weigh anywhere between 450kg for the lighter Reining and Endurance horses, and 840kg for the heavyweight Vaulting giants. “Emirates SkyCargo is excited to be working on our largest horse transport charter for the FEI World Equestrian Games Tryon 2018,” said Wilfred D’Souza, Manager Cargo Scheduling, Planning & Equine Transportation. The freight carried from Europe alone – not including the horses themselves – will total 123,500 (123,500 tonnes) of equipment, ranging from saddles, bridles, rugs and grooming kits, wheelbarrows and pitch forks, to horse shoes and all-terrain studs, as well as 51,000 kilos (51 tonnes) of feed, in-flight snacks and 20 litres of water per horse. After touchdown at GSP, the first equine arrivals were transferred directly onto trucks – without setting foot on South Carolina tarmac – for the 82km (50-mile) journey to Tryon, crossing over the state line into North Carolina with its stunning Blue Ridge Mountains backdrop. Horses from 13 countries: – Austria, Belgium, Bahrain, France, Germany, Ireland, Italy, Netherlands, Oman, Portugal, Spain, Switzerland and Sweden.